Wheat growers face many challenges to growing a quality crop that is sustainable and economically viable. Growers are faced with threats to the viability of the crop from many pests across these 42 states. One of these pests is weeds. Glyphosate is one product commonly used by wheat growers that is very effective at controlling grass weeds prior to planting or after wheat is harvested. Unfortunately, the use of glyphosate in wheat isn’t always portrayed accurately in the media. This misinformation only leads to more confusion for consumers, policy-makers, and others. 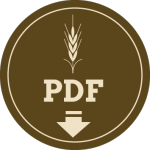 Below are some great resources detailing the use of Glyphosate in wheat! The Facts About Glyphosate, Part 1: How Do Wheat Growers Use Glyphosate? The Facts About Glyphosate, Part 3: How does USDA collect farm data? How is Glyphosate Used in Wheat? Is Glyphosate Safe for Use? MSU: Do you know about the safety of glyphosate? Learn five fast facts now!